Less than 48 hours after twelve-year-old Chris casts off on a trip to sail down the Alaskan coast with his uncle, their boat sinks. The only survivors are Chris and a boy named Frank, who hates Chris immediately. Chris and Frank have no radio, no flares, no food. Suddenly, they've got to find a way to forage, fish and scavenge supplies from the shore. Chris likes the company of a curious friendly raven more than he likes the prickly Frank. But the boys have to get along if they want to survive. Because as the days get colder, and the salmon migration ends, survival will take more than sheer force of will. There in the wilderness of Kodiak, they discover a bond they didn't expect, and through it, the compassion and teamwork that might truly be the path to rescue. Chris is excited to go sailing with his Uncle Jack in Alaska, especially since his uncle, while rather unreliable, is a link to his deceased father. The two get ready to set off, but there is another boy there, Frank, who seems to dislike Chris. Uncle Jack doesn't offer any explanations for the other boys' presence, and, unfortunately, doesn't get a chance to. Very early on, a huge storm hits, and Jack is sucked down with the boat after getting both boys to safety. They wash ashore, make their way inland a bit, and find a cabin. While Frank is still hostile, the two use the skills they have to survive, and hope that soon someone will come for them. Secrets are revealed, and the boys realize they are closer than they imagined, despite their differences. The rocky relationship between Chris and Frank sets this apart from other survival books, and adds an interesting twist to the story. It's one thing to survive with a friend, but it takes different skills entirely to survive with someone who may not have your best interests at heart! The way that Chris finds out the truth makes a lot of sense, and doesn't slow the story down at all. The beginning of this book is brilliantly fast paced; we get thrown right into the action at the beginning of the book. There are nice touches, like the creepy birds, that keep things moving along. The inclusion of items washing up on the shore after the Japanese tsunami is a nice touch that show that Lawrence is definitely familiar with the area and has done a lot of research by being in the outdoors. The survival tactics are all solid and realistic, and there is a requisite bear attack which ALL survival books need if they are set in wooded areas! 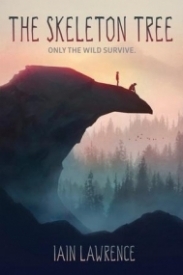 Readers of Paulsen and Hobbs who like their descriptions of dangers in the wilderness interspersed with the dangers of interpersonal relationships will be riveted by this account of Chris and Frank's attempt to survive-- despite each other.